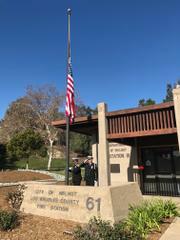 On Monday, February 5th, Deputies from the Walnut / Diamond Bar Sheriff's Station joined our partners from the Los Angeles County Fire Department Station 61 in Walnut, for a flag ceremony honoring their beloved search and rescue dog "Tanker." "Tanker" passed away on December 17, 2017. 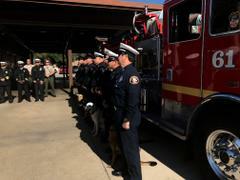 He was a bit of a celebrity at the station, and well known by the community of Walnut. "Tanker" had traveled the world, helping during several disasters, including Japan and Mexico. 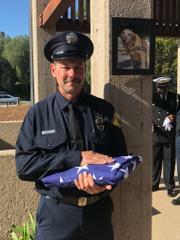 "Tanker," you will be missed!